Unfortunately, our dishwasher has been out of commission for the last few days, but our new one should be here by Friday. Yay! It's so easy to take that thing for granted, until you have to wash everything by hand. We're so spoiled! To be honest, I needed a good excuse to share this photo. I mean- it's all true, but I wouldn't generally blog about my broken dishwasher unless I had a really sweet picture (such as the one above) - that I've been waiting to post. Now, I'm pretty sure that the majority of those plates would not be dishwasher safe, but it sure makes for a pretty photo. I was wondering if those were all of your dishes. I was going to be soo jealous! Great photo! 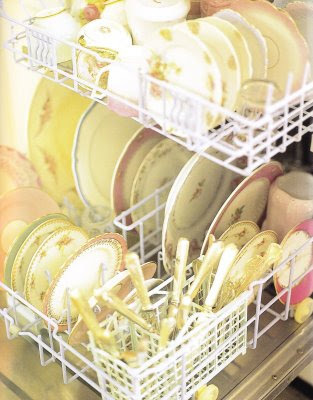 Love the dishes. Sorry that the dishwasher is not working. With a family it is hard to be without it. Glad that it will be there tomorrow. Have fun using the new one. Oh my you are so right about taking things for granted. We need those things to happen every once in a while to REALLY appreciate what we have. After living without a dishwasher or garbage disposal in our first rental after getting married then you can imagine that I just about diesd & went to heaven when we moved on to the next place that had all of those amenities. Thanks for the sweet comment, Dan & Deanna.